Like my mama, I could never take my coffee black. It just wasn’t in the cards. I prefer a light and sweet coffee – the sweeter the better, even. Okay, maybe not too sweet. But I do love my coffee when it tastes like a treat! 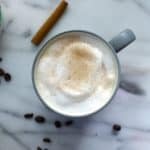 As much as I would love to have a coffeehouse caramel macchiato every day of the week, I know that’s totally not feasible or easy on the wallet. Thankfully, International Delight® came out with my favorite flavor in the half gallon sized jug! 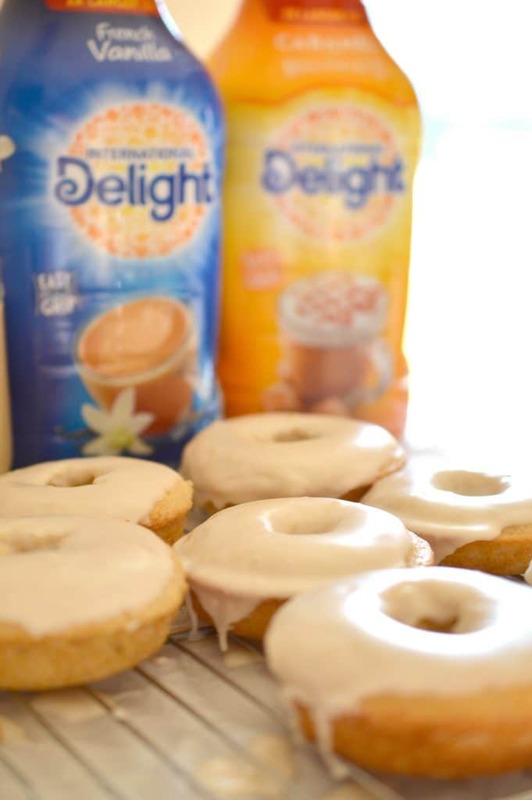 With the help of the International Delight® Caramel Macchiato creamer, I can make a tasty cup of coffee any day of the week <3 And by any day, I mean EVERY DAY! You know what goes really well with a hot cuppa joe? A tasty donut! 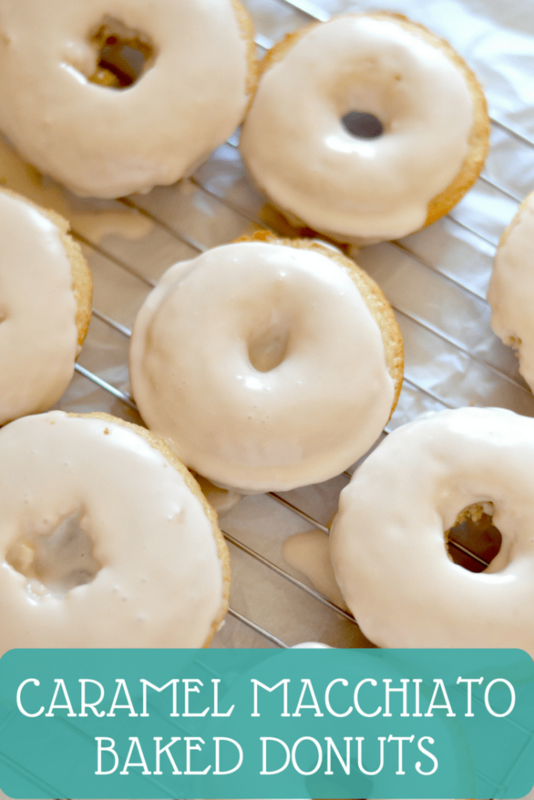  Since I’m always on the lookout to find new ways to make tasty treats a little healthier, I decided it was time to develop a baked donut recipe that didn’t involve any deep frying. So, off I went to our local Walmart where I stocked up on pantry essentials like flour, sugar and vanilla extract for my donut recipe. 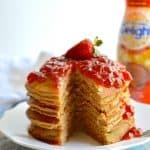 I can’t help myself when it comes to creativity in the kitchen, so I snatched up a half gallon jug of International Delight® Caramel Macchiato creamer as well as an International Delight® French Vanilla creamer jug. 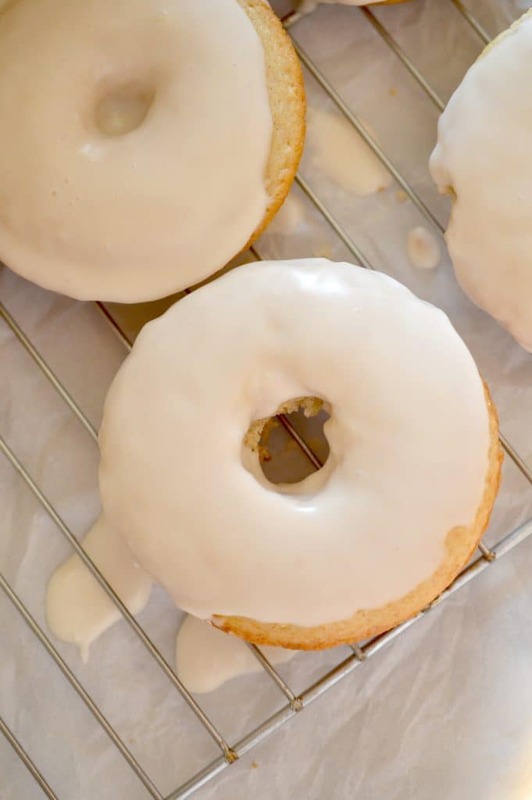 I knew these creamers were going to do double duty – some in my donut recipe and the rest for my morning coffee 🙂 I keep dreaming up no-churn ice cream recipes in my head using the creamers too, but we’ll save those ideas for another day. This donut recipe comes together really quickly once you have all of the ingredients. Dry ingredients are mixed with the wet ingredients and carefully spooned into the donut pan. Be sure to liberally grease the pan and only fill the cavities halfway – otherwise your donuts will puff over the top and you won’t have enough donut batter for all 12 donuts. Check out my latest Facebook video on how to make these donuts! If you are a true caramel fanatic, you’ll be pleased to know that I used International Delight® Caramel Macchiato creamer in both the batter and frosting/glaze. I love that the flavors start out mellow and creamy but then intensify with a richness of bold and luscious caramel. I am a dedicated caramel fanatic and basically have this stuff every day. I love that the new jugs are really easy to pour and aren’t awkward to hold at all. 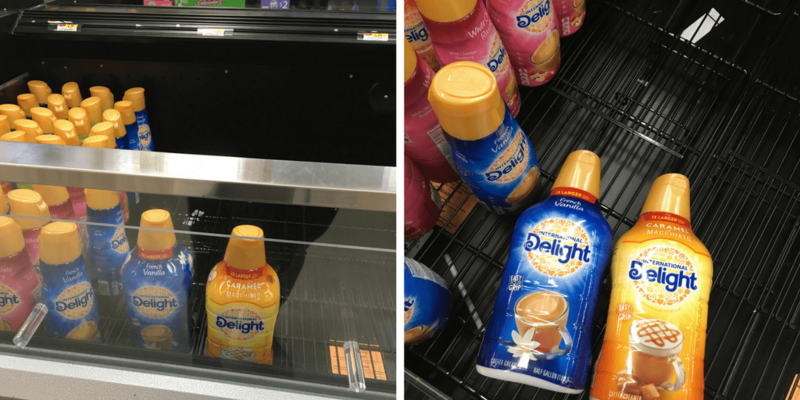 What’s your favorite coffee creamer flavor? Have you ever baked with creamer? Easy Caramel Macchiato Baked Donuts with a secret ingredient that adds SO much yummy flavor! In a large bowl, combine dry ingredients by whisking together flour, sugar, baking powder, salt and cinnamon. In a separate bowl, combine milk, International Delight® Caramel Macchiato creamer, white vinegar, vanilla, egg and melted butter. Whisk until combined. Add wet ingredients to dry ingredients and stir with a spatula until incorporated. Liberally grease a 12 donut cavity pan and use a tablespoon to spoon the batter into the donut pan. Be sure to only fill about halfway, otherwise your donuts will puff over the top of the pan. Bake for 12 minutes, or until an inserted toothpick comes out clean. Remove from oven and allow to cool, remove from pan. 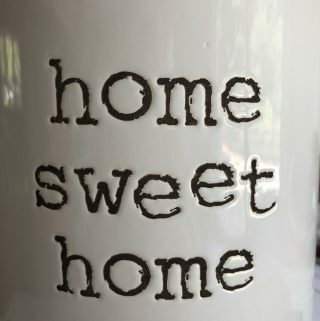 Combine powdered sugar, International Delight® Caramel Macchiato creamer and vanilla in a small bowl. Whisk until combined. Dip cooled donuts in glaze and allow the glaze to harden slightly on a cooling rack before enjoying. This recipe was adapted from Diethood. 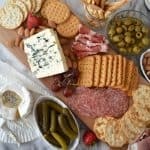 Check out the International Delight® social hub page for more yummy recipe ideas! 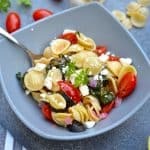 These sound really delicious! I’m so gutted I don’t have this creamer in my country! I may give them a go and substitute with something else anyway as they sound divine! I also used to be a sweet and milky coffee drinker but I recently trained myself into liking black coffee, I think the sweetness of these donuts will go perfect with my bitter black coffee!! I’m all about caramel machiato’s and donuts!! These look so delicious. That glaze is just calling for me to swipe my finger through it 🙂 . Take care. Coffee lover in da house! But to be honest, I’m one of those froufrou coffee drinkers. Like, I only drink iced coffee.. and it has to be iced latte. And I haaaaave to add a splash (or 7) of some fancy International Delight. 🙂 LOVE that you used the creamer in DONUTS! YES!! Caramel macchiatos happen to be one of my favs, so I’m just dying over these donuts! I could eat a dangerous amount of these babies. BUT since they are baked, that is allowed. Right?! 😉 Cheers, girl! OMG I’m totally a froufrou coffee drinker too and I get made fun of for it so much! I figured if I’m going to be drinking something every day, I may as well enjoy it 🙂 Iced lattes and iced caramel macchiatos are my FAAAVORITES with cold brew coming in a close second. And baked donuts mean you can absolutely eat more because there was 0 frying involved in the making of these donuts! Have an awesome week girl!! Am I glad to meet you:) I love….love coffee but never black, in fact it almost looks like this cup and oh yes…it’s got to be sweet. Now, you know these donuts are right up my alley. They look wonderfully tall with a perfectly set glaze! I never understood how people can drink their coffee black, it’s crazy! 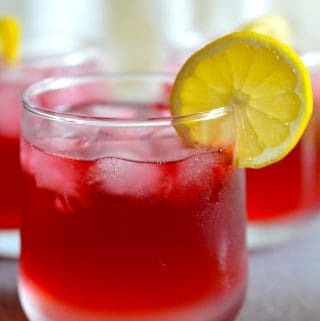 Like you, I like it extra sweet and delicious. Thanks for the kind words, Maria!! 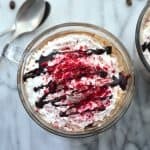 I have never baked with creamer, but it looks like I need to start cause these look fabulous! I have a touch of cream in my coffee, no sugar. I’ll save the sugar for my donut 🙂 I would have no problem starting every day with one of these delicious beauties. Plus, they are baked so they are much better than their fried counterpart 🙂 Hope you have a great week!! 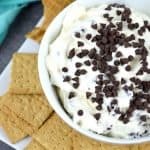 You should totally start baking with creamer!! I’ve put it in cupcake buttercream before and I loved it so much I figured it would be great for donut frosting 🙂 Baked is always a safer alternative to the fried goodies, but sometimes it is nice to treat yo’ self, haha! I hope you have a lovely week as well, Dawn! I absolutely love baking with International Delight! 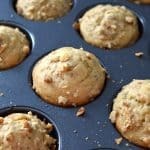 It’s such an easy way to add all sorts of fun flavors to baked goods. 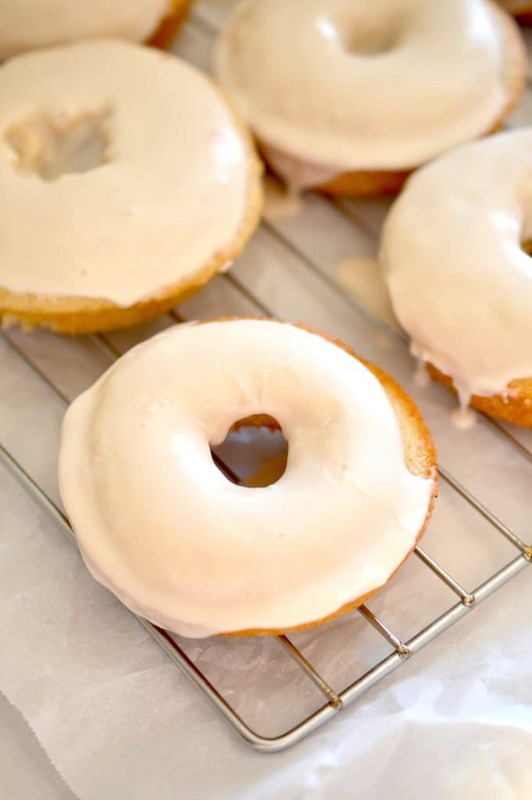 And speaking of baking, these Caramel Macchiato donuts are calling my name! 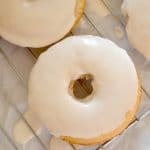 I love homemade donuts, and these sound like they’d go perfect with my cup of morning coffee that I’m drinking right now! 🙂 If you have any leftovers, I can help you get rid of them. Just sayin’. Dang it, I just finished the last one of the batch this morning! 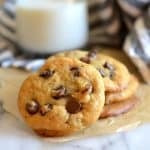 I love baking with International Delight too because you get all the fun flavors without having to go to the store and searching for those elusive flavoring extracts when you’ll only use a few drops. I always finish my creamer bottles so there’s zero waste there 🙂 I hope you have some homemade donuts in your future! These donuts look fabulous! I too love caramel macchiatos and would have them more often but wouldn’t like what they did to my wallet or my thighs. 😉 I’ve never baked with creamer, although I want to rectify that! I recently bought a new doughnut baking tin but did not get the chance to bake with it yet. I love the flavours of caramel and macchiato. Yum! 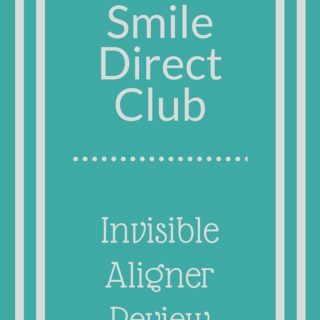 Diana – you definitely have to bake a batch of homemade donuts! My first ever batch in my pans was a double chocolate recipe. You can’t go wrong with any donut, really! Ooh, that glaze sounds fantastic! 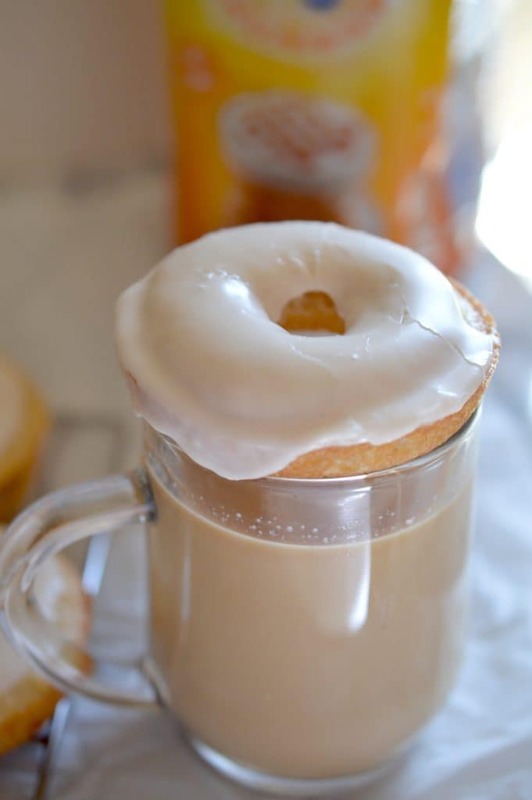 I am n ot a coffee drinker but I definitely love to eat donuts and these sound delicious! Thanks, Janette! Coffee is an everyday thing for me, donuts are just a sometimes treat 🙂 thanks for stopping by!